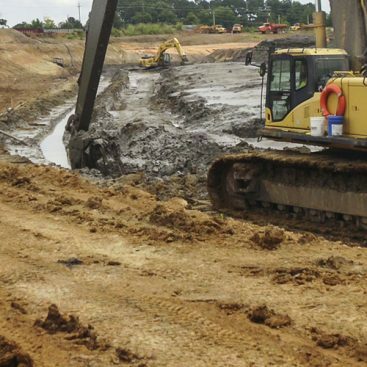 This project completed with the solidification of over 30,000 cubic-yards of fly ash. The fly ash was generated as a byproduct of oil-fired electricity generation at a power plant operated by Central Maine Power Company in Yarmouth, Maine. The area solidified is a 2.6-acre lagoon directly adjacent to Casko, Bay. The scope of work for the project included clearing and grubbing, solidification activities, construction water treatment, installation of test pits, re-construction of a tide gate, demolition of several site structures, import of earthen materials, grading and re-vegetation. Solidification of the fly ash was achieved by introducing a cement/water slurry to the material and mixing the resulting matrix with a hydraulic excavator. The cement/water slurry was produced on-site by Geo-Solutions utilizing one of our 5 cubic-yard batch plants. 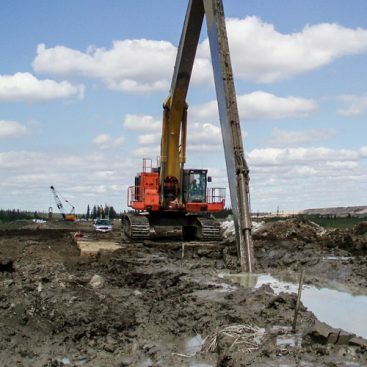 Liquid slurry was chosen for the project to mitigate dust emissions that would have resulted with dry cement. The greatest challenges to production on the project centered around water treatment and the discharge of treated water. Geo-Solutions operated and maintained a round the clock water treatment system to handle this task. Water at the site was treated for the adjustment of pH and removal of suspended solids form prior to being discharged directly into Casko Bay. Geo-Solutions maintained a strict quality assurance program to insure that the water discharged into the bay was of the highest quality and no threat to the local environment.